Jacob's Personal Chef services, provides fresh nutritious, exciting unique custom dishes to meet your individual food preferences, from dietary constraints, health & fitness, and dishes with exploring variety of cultures and cuisines with enhancing dining dishes with creative twist withing your custom flair. Personal Chef Services provided are In home meal planning, interactive cooking classes, food consultations, dinner party services at small group size up to (20) people, from (3 to 4) course plated dinner events with bite size starting canapés. Services are provided in the comfort of your home, while the chef is busy crafting your dishes you and your guests have the opportunity to learn about your chef, while (seeing the action in the kitchen is right in front of you)of fresh from scratch created dishes prepared with entertaining advantage. With the assurance your unique dishes are specific to standardized quality starting from farmers market hand selected ingredient's to your kitchen. 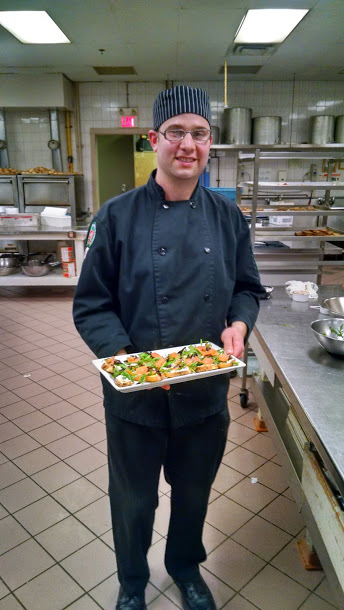 Your personal chef Jacob, has been in the culinary industry for over (20) years, starting out with culinary school at Niagara College Canada, culinary management co-op diploma program, Graduate class of (2006). Active member in good standings with United States Personal Chef Association and certificate holder from the Culinary Business Academy, successfully achieving professional personal chef training program, awarding the title personal chef. In the chosen career, I your personal chef Jacob Lucas, have worked for many of Niagara's respected top restaurants, hotels, catering firms, turning the passion from past experience to personal cheffing in the comfort of your home. With driven passion comes along great wealth of knowledge, talented skill & experience to individual client's, your family, guests, co-workers. This is all possible due to my career in the culinary industry, working for many crafted chef's from many different culinary opportunities of unique personalities in my many years, in tern presenting you a well rounded dining experience. Personal chef Jacob can bring forward variety of cuisines specific to your culinary or healthful food requirements to meet you and your guests individual requirements. Each unique food dish posted on Jacob's Personal Chef Services website, is created from scratch of natural fresh ingredients in specific detail. Ingredients are purchased from respected Niagara's own farmers markets. The pictures of the dining courses, gives you a view of what you will expect prior to selecting my personal chef services, in making an informed decision of quality unforgettable experience. Services provided of high quality standard for each individual - with preparations of natural ingredients prepared from scratch - based out of local farmers market's - when and if products are in season. (100%) service quality standard will be confirmed from in home free tasting and on site services. Watching myself chef Jacob prepare specific ingredients based on menu confirmation - something you wouldn't see in most restaurant's.